"Der Mehsch lebt nicht von Brot allren. Nacht einer weile braucht er einen Drink." A Handmade Giant Pretzel (Grosse Brez'n) purchased from the Pretzel Maiden's overflowing basket at Munich's famous Hofbräuhaus. It's bigger than my head! The Verdict: Munich is an interesting place - though we felt a heaviness there. Was that due to the gray soppy weather, or perhaps the gravity of events in Munich's past? Many intelligent and interesting conversations were had as our group processed the role of this city in World War II. Enlightening. Sobering. But also very good Beer! Hello? Do I have a caller . . . The Bonus of Bus Time? We'd start every ride with our "Rolling Radio Show" in which Holger would take "callers" from around the country. He'd structure the first 15 minutes or so around debriefing what we'd just experienced and take "callers" to give their views. We'd share our name and where we were from (so great to cement our budding friendships) and then share our thoughts and impressions on the topic du jour. Room to Breath. Because Rick Steves limits the size of Tour Groups (24-28) there's always room to spread out on the bus. Most folks elect to have their own row! Holger always made use of Bus Time. He'd review logistical plans, give free-time options, discuss history and background information about the places we were heading to. We'd also have time to ask and have our questions answered. The Sound of Music. Cultural music, that is! Brahams in Germany, Yodeling and Alpenhorn in Switzerland, Viennese waltzes and Opera in Vienna, the Sound of Music in Salzburg and much, much more! A little downtime. Of course, there was plenty of time for napping, reading, journalling, conversation or simply enjoying the beautiful scenery. Holger was always bringing us treats! Bus time was fun sampling LOTS of tasty regional snacks! Think German Rieslings and Swiss Chocolate. YUM! Buddy Checks complete and the gang is ready to roll! "Do I have a Caller?" Holger, doing his thing: expertly preparing us for what's next. Meet Henri, our bus driver extraordinaire! He's pretty much a super-hero in our books. I'm still in awe of his Swiss Alp driving skills. Incredible. Kim, perusing some of the literature Holger has provided about our next city on the Tour. What does a BMW have in common with a Maypole? Why, they are both checkered and striped with the colors of Bavaria, of course! Blue for the Bavarian sky and white for the clouds that float in it. Honestly, this trip was FULL of so many #YES2JOY moments it’s hard for me to pick just one! The older I get, the more I believe, that our joy in life is ultimately something we choose. So, I decided to share moment where I had to choose the joy for myself: it wasn’t dependent on my friends help to get me there. This #YES2JOY moment came in Munich. After touring with the group in the morning, we had the rest of the day to explore the city on our own. We girls made our way to the English Gardens only to be drenched in a torrential downpour. We dried off and reinvigorated ourselves with a delightful lunch at the famous Hofbräuhaus. Kristi and Kim wanted to climb the tower at St. Peter’s Church but I wasn’t feeling up for it. I chose to break off on my own, in a city I wasn’t too familiar with because I was craving some reflection time. This can be hard when you’re someone like me who doesn’t want to miss out on anything! I stumbled upon the wonderful Caffè Piemonte. It was crowded due to the soggy afternoon, but I lucked out and got a spot in the front window, ordered a Latte Macchiato and a few pastries to enjoy, pulled out my journal and began to write and write. So many adventures had unfolded in just one day and I wanted to remember it all! ​I found myself being filled with joy reflecting on all we'd experienced these last days, swooning over the tasty treats, the delicious warmth of my drink on such a drippy day, as people passed by under their colorful umbrellas and watching locals order the largest desserts I have ever seen! It was such a wonderful moment with just myself, and I chose it. ​Gratitude abounded as I said #YES2JOY in Munich!! Communal tables at the Hofbräuhaus allow us to mingle with the locals. 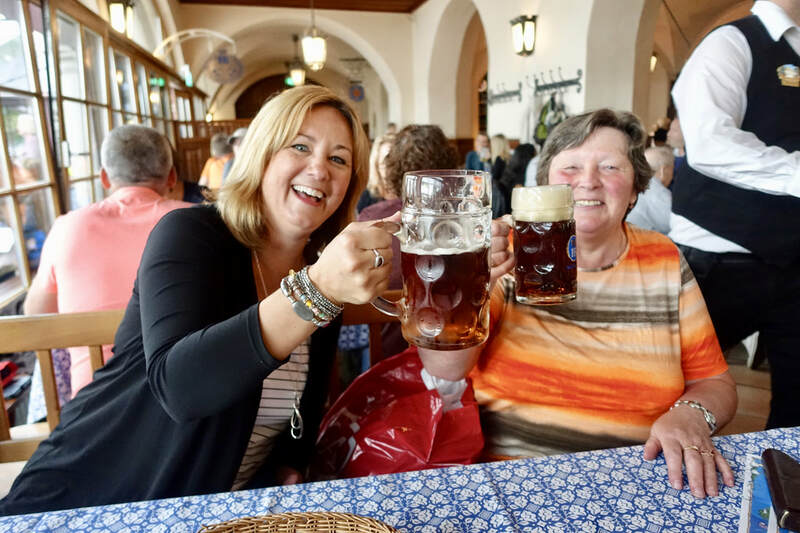 Even though she didn't speak much English, this Frau (in Munich from her home in Lake Constance for a day of shopping ) was nice enough to instruct us on the correct way to enjoy our Bavarian sausages! Prost! Three for the Price of One! All ordering different entrees and sharing plates expanded our exposure to local cuisines and increased the "Delight of the Bite" without over-extending our pocketbooks or our stomachs! Keep the Money Simple To keep transaction time down and simplify payments, we designated Kristi to be the "payer" for all group activities. All shared hotels (like the triple rooms in Bacharach and Keflavik), meals and extra activities we all participated in were paid for in a lump sum. Keeping careful track we simply divided the total by three at the end of the trip, settling accounts during our airport layover in Vienna on the way home. Easy peasy!